How to disable Personal Security Report?? I saw a few threats back to at least 2015 where a number of users requested disabling Personal Security Report notification. Webroot support seems to be fending off this request despite encouraging users to asking for the change. I'm more concerned about this blatant instrusion of privacy. Basically user scan file details are being reported back to Webroot for each scan. There is no way to disable this back channel. If this doesn't get corrrected, I won't continue to use it. Why does a user HAVE TO report to Webroot what files it scanned?? I appreciate your concern about your privacy and how this may appear to be invaded by what you call 'user scan details' being fed back to Webroot as part of each scan. However, I am not aware of whether or not you understand basically how WRSA works in terms of detections made to protect the user? Simply put WRSA scans the client system' systems disk, complies details of what it has found and then transfers the results into the Webroot Cloud for the core analysis against the master database that is held there. As far as I know the information transferred is as minimal/just what is required to do the job so to optimise the process & make it as fast as possible. The approach is also why WRSA scans so quickly, uses such a small amount of system resources & provides such good protection...everything is done in the Webroot Cloud, where the whitelists that are used for detection as update 24/7....so that the latest threats are covered without the need for periodic signature updates at the client software level. So, hopefully that gives you a view as to why (minimum) data gets fed back to Webroot, from which they also provide the Personal Security Report (as a service to users). NOw without this transfer WRSA cannot do it's job and therefore sadly, I have to say that if the way WRSA works causes you concerns then regrettably you most probably need to look elsewhere for your protection needs. As for the Security Report & trying to gain some control over when and how often it pops up...yes, we are trying to get that changed but Webroot's prime focus, as I understand it, is protection and therefore changes to keep that up at its current stellar level willalways take precedent in the list of things to be done...but that will not stop us continuing to try to get this change. I hope that I have understood you concern and be able to assit with the information provided...but if not then pelase post back and we will look to assist further as best we can. That's just the standard reply & points from afew years ago. Nothing has changed. Clearly and undoubtedly you don't want to change the report process. That is now very clear me. I don't want to waste time keeping asking about it. Neither do many others. I am OUT. This isn't something I want: to sacrifice privacy & security for ... security. Webroot values and protects your privacy and security. There is nothing standard about my response...I am a volunteer, and NOT a Webroot employee and so have no vested interest in Webroot or WRSA other than my view that the product is the best on the market and does its job very, very well. As I stated I do understand your concerns; I share some of them more generally infact, but do not believe or feel that Webroot in anyway oversteps the mark or undertakes nefarious activities in relation to data...well, no more than the norm/what many of the major players in the AM/IS/AV sector do, and there are some that are very underhand about what they do in realtion to data gathered. As also stated, what & the way that Webroot do what they do is fundemental to the design of WRSA...and therefore, in all honesty, I cannot see it changing any time soon; or at all for that matter...therefore, regretably, if you cannot be persuaded by what has been posted in this thread, in response to you issue, then your best option is indeed to call it a day, and seek what you are looking for elsewhere. Personally I fear that you will not find what you are looking...given what I have advised previously...security invariably comes at a cost, to some degree, in terms of privacy...the question is the degree one is willing to accept, and clearly you have not found that. Since you posted to WSA Antivirus Forum and I run WebrootSA Antivirus. I'll mention in passing that I've not seen "Personal Security Report" notification. Are you running WSA Antivirus? Regardless, I have no issue with Webroot telemetry. I have no issue with Webroot Intelligence Network telemetry. I have no issue with Webroot "back channel" collecting data. Respectfully, since I have not seen "Personal Security Report" notification. Perhaps, I'm not fully appreciating your concerns. That's just the standard reply & points from afew years ago..
Actually, honestly that is not a canned response but a genuine explanation as to how Webroot works. It was important for Baldrick (who, like me, is not a Webroot employee but just an ordinary user who is happy to use his own time to answer questions on this Forum) to explain this so that you understand that the elimination of Personalised Security Report would not deal with your perceived issue of privacy and security. As he says, regardless of Personalised Security Report, Webroot's method of protection does require limited information being transferred to the cloud. If you are not happy with this approach, then you should indeed perhaps think of changing to another security product. You are not the only one who finds the Personalised Security Report an annoying intrusion onto our screens, and it is true that we have been asking for a change for some time. It is also true that the time being taken for this request to be processed by Webroot is very frustrating. Having said that, this does not stop me using Webroot as I personally believe it provides me with the best security protection on the market. Which, to my mind, is the most important thing. EDIT: I did not see Baldrick's second post. I seem to have duplicated much of what he said there. However, I leave what I said above as it underscores the points he made, as well as agreeing with you about general frustration regarding Personalised Security Report. I'm not sure what qualifies as "minimal data" sent back to webroot. But from this table on page 3, webroot stands out as the only one that collect all data, personal data, web addresses, IP ... etc., among two dozen antiviral software. I seriousy doubt that's what I want getting into. The slight performance gain cannot justify that for me. Other software collect data as well, more or less. As I advised earlier...it is what it is and clearly a matter of personal preference, so if you are not happy please stop insisting...you have made your point, your are not happy so best to move on to another solution that better suits your 'preferences' as I very strongly doubt that Webroot will change anything on the basis of this thread. Best of luck with your search but looking (brief glance at others) at the potential candidates you have it looks like you will have your work cut out as most of the main security app providers seem to operate in a similar way to Webroot. Thanks for posting 2014 AV comparative. Last Revision: May 2014. Where may I find 2017 AV comparative. 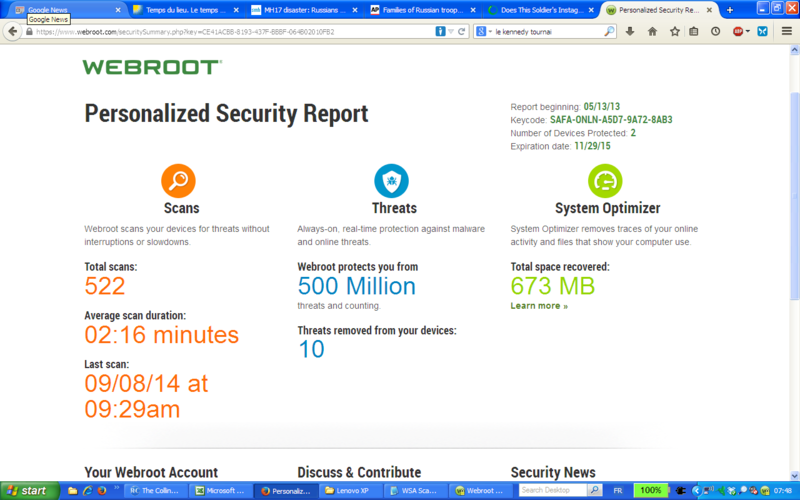 I'm relatively new to Webroot. Perhaps, I did not understand your opening post. Are you wanting a user option to disable Webroot telemetry. Based upon my read of your opening post. I thought there was a "Personal Security Report" "Personal Security Report notification" that I had not seen yet. So, (please correct me) you want a Webroot telemetry opt out. My prior security soft had a toggle Off for collecting crowd sourced telemetry. I always had telemetry switch On. Just me. I want my security soft to know what is on my machine & what my machine is doing. I seriously doubt Webroot is uploading & reading personal documents. Just me. Crowd sourced telemetry is industry standard & ubiqutious. I have removed webroot and went back to Kaspersky. Webroot is faster. But weighing everything, I prefer something that I have more controls beyond basic data collection. Webroot offers little control for me. I also have a license for Bitdefender but the horrendous registration process stopped me from using it altogether. They appeared to have oversold/sent codes to multiple users (maybe accidentaly, but I doubt) blocking me from activating it for the year. Anyhow, thank you and good luck. So you'd rather trust a Russian company, with links to Putin and the Russian government, with your computer security and sensitive data over an American one? I wish you luck and hope you find the balance you're looking for. Russian or not, trust is a bit of stretch these days as far as computer data are concerned. I dislike Cloud in general. Every piece of data lost so far and I'm aware of were at US-based financial institutions or vendors. Also, doesn't Google send back data or allow it to happen to its server and mining the data? How come very related ads show up quickly in the browser while searching for a product? It seems it has got a little better recently. Its a fact we've to live with, I suppose. Trust? None so far, because they haven't showed anything to let me put in trust. All the talking is just placebo effect. I think we all know that. In the end, the market will dictate, live or die by offering reliable trustworthy product. Obviously, not everyine is looking at the long-term interest. Please, where is the "Personal Security Report". I've re-read How to disable Personal Security Report?? from the opening post. Please point me to the "Personal Security Report". The "report" notice popped up once. Then, it seems to be at the bottom of the main screen with a link to see the report. I don't have the program on my computer anymore. I only used the program for a week or two. I'm sure my knowledge is very limited compared to the guru here. .....darn, not recalling popup and not finding link at bottom of main screen.....head scratch? Well, with all due respect, Muddy, it all boils down to who you believe. I think I'll take the the concensus of our intelligence community, who all agree that Russia meddled in the US election through hacking and propaganda, over the words of a disgraced, drug addicted, unhinged also-ran. McAfee has also been arrested for illegal drug manufacturing, weapons violations, and remains a 'person of interest' in the murder of his neighbor in Belize. To say nothing of the gigantic turd that is McAfee AV (I believe Intel owned McAfee since 2011 before returning it to a standalone company last year). I do agree with some of what he said. Especially the first things he said. "We need to define what cyber-security is. There's the protection of our privacy, which we have none, by the way, and there's protection of our...critical data, we have none of that ..."
I mainly made the statement I did because the OP was concerned with the (anonymised) data that Webroot is collecting. I highly suspect that Kaspersky collects very much of the same type of data. So it really comes down to who you trust more with that data. Would you rather have that data stored on US servers and managed by an US company in the US or would you rather have that data stored on a Russian server, managed by a Russian company in Russia, a country that is a known enemy of the US? If things got really bad between Russia and the US, who's to say the information and access that Kaspersky has couldn't be used in a nefarious way? -- I looked thru the PC User Guide for Personalized Security Report information. No joy. -- Is there documentation for the "Personalized Security Report". 1. Personal data collection on a political, government and state level is a problem and particularly so, it seems to me, in the US. So is corporate personal data collection, with a view to using them (e.g. with supermarket loyalty cards, or Big Google Brother, or Microsoft Account and the Microsoft Cloud, etc. etc. ), or sharing or selling them to others. This is and/or could potentially be a concern for people who trust their sensitive data, regardless by what means, to the cloud in the USA. 3. I don't know the history of McAfee security software very well (I need others more knowledgeable than I to educate me on this), but I have sometimes wondered whether there may be a similarity to Norton pre- and post-Symantec takeover, i.e. from jewel pre- to turd post- analogy if you follow my gist. Others such as you may be able to enlighten me. I've found a screen capture of an old 2014 Personalized Security Report for my XP device.